A root canal is a treatment used to repair and save a tooth that is badly decayed and infected, or causing a patient severe pain.Â Â During this procedure the nerve and pulp are removed and the inside of the tooth is cleaned and sealed.Â A root canal tooth usually requires a crown and build up and post and core afterwards. A filling is a way to restore a tooth damaged by decay back to its normal function and shape. When Dr. Le gives you a filling, she first removes the decayed tooth material, cleans the affected area, and then fills the cleaned out cavity with a filling material. By closing off spaces where bacteria can enter, a filling also helps prevent further decay. A dental implant can do wonders for self-esteem, because it feels and looks like a normal tooth. A dental implant is a titanium post (like a tooth root) that is surgically positioned into the jawbone beneath the gum line that allows your dentist to mount replacement teeth or bridge into that area. An implant doesn't come loose like a denture can. If a tooth has been broken or damaged by decay, Dr. Linh U. Le will fix it. Dr. Le will fix it with a filling, crown or other dental treatment. But when there's too much damage for the tooth to be repaired, the tooth may need to be extracted â€” or removed â€” from its socket in the bone. A root canal is a treatment to repair and save a badly damaged or infected tooth. The procedure involves removing the damaged area of the tooth (the pulp), cleaning and disinfecting it and then filling and sealing it. The common causes are a cracked tooth, repeated dental treatment to the tooth or trauma. Brightening your smile is as easy as visiting Dr. Linh Le for a whitening treatment. Using a whitening toothpaste or mouthwash, trying whitening pens, strips or trays are all good ways to supplement your normal oral hygiene habits Sometimes after whitening treatments, teeth can be sensitive. Bridges and crowns are prosthetic devices that are cemented onto existing teeth or implants, by Dr. Le. In addition to strengthening a damaged tooth, bridges and crowns can be used to improve a toothâ€™s appearance, shape, alignment and dental occlusion (bite). After 20 years at the same location, Dr. 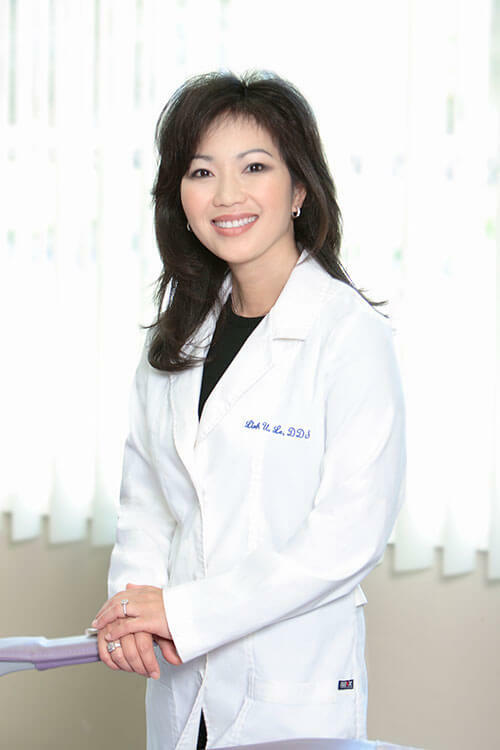 Le has gained a reputation among her patients for being professional, knowledgeable, comprehensive and gentle. Copyright © 2017 Dr. Linh Le Dental. All Rights Reserved.